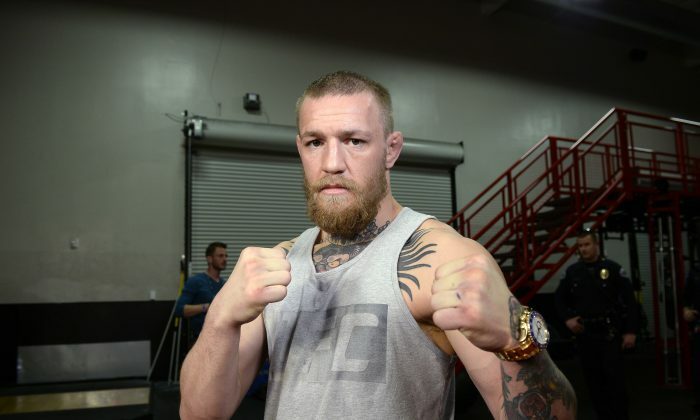 Popular UFC star Conor McGregor—who announced his shocking retirement last week via Twitter, only to take it back two days later in a long Facebook post that explained his dilemma with UFC marketing and promotions requirements—says he’s finally back on track for his much-anticipated rematch with Nate Diaz at UFC 200 in July. McGregor’s apparent unwillingness to fly out to Las Vegas to help do promotions for UFC 200, combined with Diaz’s stated desire to only wanting to fight McGregor at UFC 200, has certainly put UFC President Dana White in a tough spot. McGregor is the sport’s biggest star and his rematch with Diaz was to be the main event in July. Without either fighter going, the event would appear to lose some luster. White told ESPN on Saturday, shortly after Jon Jones defeated Ovince Saint Preux at UFC 197, that it was possible Jones could instead headline UFC 200 against Daniel Cormier. Diaz handed McGregor his first UFC loss in March at UFC 196—a second-round defeat via submission. McGregor was supposed to take on Rafael dos Anjos for the lightweight title, but dos Anjos withdrew with a foot injury. Diaz stepped in on 11 days’ notice and won in a stunning turn of events. Previously, the 27-year-old McGregor had run roughshod through his three 2015 matches, including a featherweight championship bout victory over Jose Aldo at UFC 194 in December that took all of 13 seconds and catapulted him into superstardom.